A trail of money stretching from a Panamanian shipping agent to an octogenarian Singaporean to a Chinese bank provides a window on why U.S. efforts to tighten sanctions on North Korea may be harder to achieve than in the case of Iran. For decades North Korea has built networks of front companies and foreign intermediaries to channel currency in and out, circumventing attempts to isolate it over its nuclear-weapons program. Court documents and interviews with investigators, banks and prosecutors show the cornerstone of those networks is China. "Its geographic proximity, the huge trade volume, having the contacts, and having the historic relationship all contribute to making China the center point for any North Korean initiative to evade international financial sanctions," said William Newcomb, a former member of a panel of experts assisting the United Nations’ North Korea sanctions committee. "China is a very important piece in making sure that blockages work." Sanctions applied by the U.S. and other countries to pressure Iran to stop its nuclear weapons program included the freezing of about $32 billion of oil revenue held at banks overseas. Those accounts were unlocked after last year’s nuclear accord, negotiated with world powers including the U.S. and European Union. But Iran’s much larger overseas revenue and its dependence for funding on oil exports made its international finances easier to track. Its economy is about 15 times the estimated size of North Korea’s, and that country’s decades of isolation mean its economy is more self-contained. 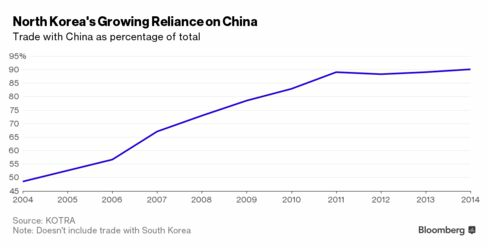 North Korea relies on China, its biggest trading partner, for food, arms and energy. The countries describe their ties as "friendship forged by blood" during the 1950-1953 Korean War where the U.S. was a common foe. China has criticized North Korea for provocative actions but historically opposed harsh sanctions that might precipitate a regime collapse and a flood of refugees across its 870-mile (1,400 kilometer) shared border. To inject life into an economy made moribund by the fall of the Iron Curtain, failed centralized policies and sanctions, Kim Jong Un needs foreign currency to pay for equipment from abroad, such as the recent purchase of Russian jets to upgrade the national airline. About 70 percent to 80 percent of North Korea’s foreign earnings have in the past come via China, said Kim Kwang Jin, who ran the Singapore branch of North Korea’s North East Asia Bank before defecting in 2003. “That huge trade volume means there are more people in China who are willing to cooperate with the regime," Kim said by phone from Seoul. China’s Foreign Ministry and central bank didn’t respond to faxes seeking comment on what measures China is taking to stop the flow of illegal money to and from North Korea using banks and intermediaries in China. 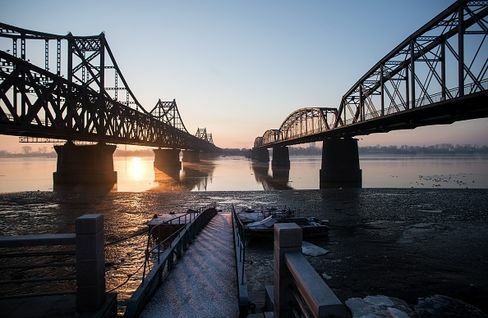 A tightening of control in China would make North Korea more dependent on the connections it has built up to do business further afield, where it risks having funds frozen in overseas accounts. To avert this, the regime uses a mix of bank accounts in the names of intermediaries who wire money at its request. One example of how those intermediaries work can be seen from Chinpo Shipping Company Ltd., a Singapore-registered ship-supplies firm set up by 82-year-old Tan Cheng Hoe, which channeled North Korean funds for years, according to court documents. Chinpo’s role came to light after a routine inspection of the Chong Chon Gang, a North Korean cargo vessel passing through the Panama Canal in July 2013. 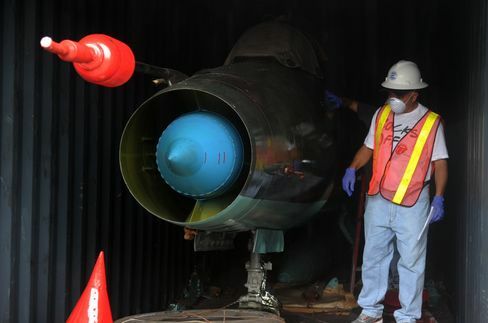 Inside the hold, hidden under 200,000 bags of sugar, were disassembled MiG-27 fighter jets, Soviet-era radar systems and munitions headed for Cuba. Inspectors also found documents detailing a $72,017 wire transfer from Chinpo to C. B. Fenton & Co., a Panama shipping agent, to pay for passage through the canal. The seizure sparked a two-year, international investigation that led to Singapore and brought the first criminal conviction for offering financial services to facilitate North Korea’s arms proliferation. Singapore District Judge Jasvender Kaur fined Chinpo S$180,000 ($128,000) in January for violating UN sanctions and remitting money without a license. Edmond Pereira, Chinpo’s lawyer, said the company is appealing the conviction and fine. Tan, a director of Chinpo, wasn’t accused of wrongdoing. Calls to Chinpo’s office were unanswered. Court documents, UN reports and interviews with lawyers on both sides show the payment for the Chong Chon Gang was the tip of the iceberg. Between 2009 and 2013, North Korea used Chinpo to funnel more than $40 million through the global financial system, even after other Asian banks blocked Chinpo’s accounts for making suspicious transfers. "It’s almost as though this was their bank account for worldwide expenditures," said Sandy Baggett, who led the case against Chinpo as a Singapore deputy public prosecutor. The difficulty for North Korea was avoiding the attention of U.S. regulators, who can go after foreign banks conducting dollar transactions, because almost all are routed through clearing networks in the U.S. Tan minimized scrutiny by leaving ships’ names off wire transfer forms, testifying in court that Bank of China had advised Chinpo to do so. Bank of China has denied it knew the payments were linked to Pyongyang. Bank of China officials did not respond to e-mailed requests for comment on the payments or its vetting system for suspicious payments, said Unice Liu, a consultant at Baldwin Boyle Group in Singapore which provides public relations for the bank. Chinpo’s Bank of China accounts were closed in December 2013. “I think it was just really a lack of internal anti-money laundering procedures within the bank,” said Baggett, now a consultant for Freshfields Bruckhaus Deringer LLP in New York. Court papers show Bank of China was the only lender that processed Chinpo’s North Korean transactions. Other banks including Singapore’s United Overseas Bank Ltd.shut down Chinpo accounts in 2005 for attempting to carry out suspicious wire transfers. Chinpo was told the money coming in was payments from clients who used North Korea’s ships to carry cargo, according to testimonies. Those payments were sometimes as much as $500,000, an unusually large amount for a shipping-related fee, said Baggett. Baggett said that, once a year, a woman with diplomatic status would show up and ask Chinpo to withdraw as much as half a million dollars in mint banknotes. 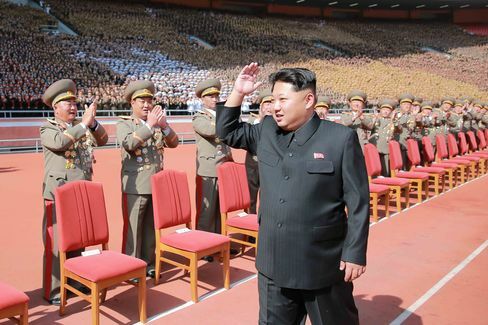 Newcomb, the former UN sanctions investigator, said North Korea’s money largely stays abroad. Funds from sales of North Korean goods and services are held in the same offshore accounts, ready to be used to pay salaries for diplomats and officials operating overseas and to buy equipment or supplies. Money returned to North Korea is taken across the border in cash. Chinpo wasn’t the only one helping North Korea make payments. When Austrian luxury goods broker Josef Schwartz was investigated in the late 2000s for fraud and money-laundering, he reassigned his contract to buy two yachts on North Korea’s behalf to Complant International Transportation (Dalian) Co., according to Newcomb, who investigated the case. The Chinese logistics company was declared the end user for eight Mercedes cars Schwartz’s firm had purchased on behalf of a North Korean citizen, according to a 2012 report by the UN sanctions committee’s panel of experts. Complant didn’t respond to a fax requesting comment on the transaction. North Korea has also tried to expand ties with Russia, especially as it shifted to ruble-based transactions in 2014 after Russia wrote off 90 percent of its $11 billion debt, said Ludmila Zakharova, a senior researcher at the Institute of Far Eastern Studies at the Russian Academy of Sciences. "Russia is observing the sanctions regime in full," she said, but the shift to the ruble helps "keep trade away from sanction mechanisms." Since October 2014, transactions had been going through Regional Bank For Development, a small bank whose office moved to Moscow from Russia’s Bashkiria republic shortly before its license was revoked in 2015 as part of a nationwide review of lenders, and transactions are probably now going through China until a replacement bank can be found, Zakharova said. 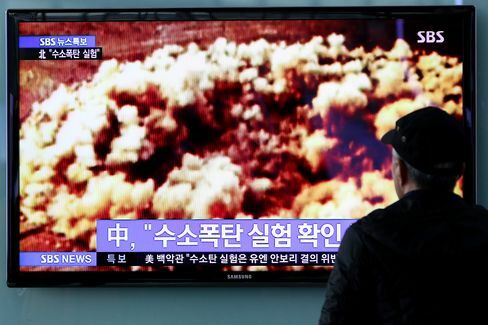 In the aftermath of North Korea’s fourth nuclear test last month, U.S. President Barack Obama signed into law a bill that requires him to sanction individuals, foreign governments and financial institutions involved in prohibited transactions with North Korea. But the key is China, which has resisted efforts for UN sanctions to target energy shipments to North Korea. Squeezing Kim so hard that the regime collapses could also remove the buffer between China’s northern border and the U.S. military in South Korea. David Asher, a former George W. Bush administration official who was involved in freezing North Korean assets at Banco Delta Asia, said sanctions can only be effective when China is coerced into cooperating.